On this day the expedition to the Pacific Ocean passed the Platte River. Captain Clark wrote, "This Great river being much more rapid than the Missourie forces its current against the opposit Shore . . . we found great dificuelty in passing around the Sand at the mouth of this River. Capt Lewis and My Self with 6 men in a perogue went up this Great river Plate about 1 miles... I am told by one of our Party who wintered two winters on This river that it is much wider above, and does not rise more than five or Six feet.... The Indians pass this river in Skin Boats which is flat and will not turn over." Clark mentioned other streams including "Papillion or Butterfly Cr, 18 yds. wide," which empties into the Missouri a few miles north of here. After passing the mouth of the creek, the expedition camped for the night on the Nebraska side. Clark records "a Great number of wolves about us this evening." 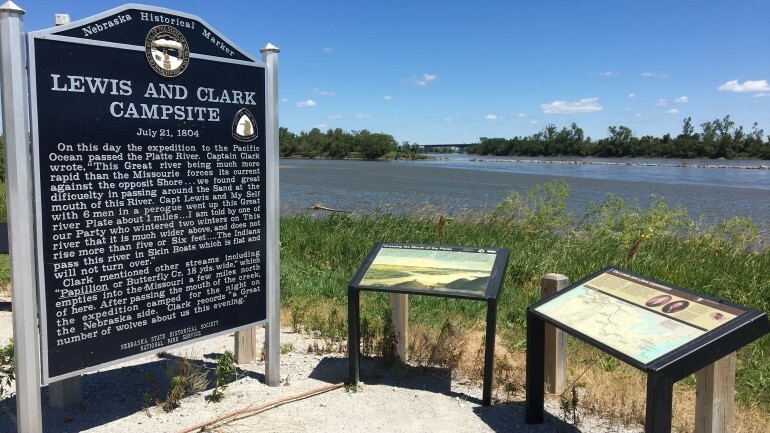 “Lewis and Clark Campsite: July 21, 1804,” Explore Nebraska History, accessed April 19, 2019, https://mynehistory.com/items/show/53.